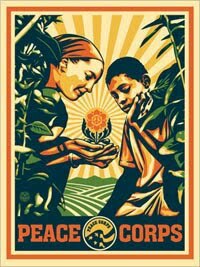 officials tell the story of the beginning of the Peace Corps, including getting Congress on board and keeping the CIA out. Distinguished Professor of Higher Education in Antioch University’s Leadership and Change Ph.D. Program. Guskin was a doctoral candidate at the University of Michigan when Kennedy visited the Ann Arbor campus where Guskin was involved with a student group, which is widely credited with inspiring Kennedy to establish the Peace Corps. On August 28th, 1961 President Kennedy held a ceremony at the White House Rose Garden to honor the first groups of Peace Corps volunteers setting out for service projects in Ghana and present-day Tanzania. Fifty years later, WYSO presents “Kennedy and the Peace Corps” on August 28th, 2011. Produced by Lester Graham of Michigan Radio, Kennedy and the Peace Corps” will air locally on Sunday, August 28th at 6:00 and 11:00 PM on WYSO 91.3 FM and streaming live on www.wyso.org.